One hundred twenty-two years and one hundred and sixty-four days. That is the apparent record for the longest confirmed human lifespan. Whether or not increasing your lifespan is of interest to you or not, this fact might be: the record maker, Jeanne Louse Calment, did not die of the two most common causes – heart attack or cancer. Rather, she died in 1997 from old age. She could probably whisper to us a pointer or two on how to live long and well. And apparently she did, as when asked about why she was able to live so long and in such good health, she attributed it to her extensive use of . . . olive oil – inside and out. Everything olive – the fruit itself, the oil and its leaves – all contain abundant amounts of tyrosol which is what scientists suspect is one of the major antioxidants supporting such great health benefits. Green tea and wine share high amounts of tyrosol as well. Many ancient cultures, particularly those of Italy and Greece, used olives and olive oil as a major component of their diets – now referred to as the Mediterranean diet. This tyrosol rich diet has been proven to lower the risk of developing cancer, dementia, and several heart diseases, particularly coronary heart disease. The Mediterranean diet also lowers the risk of mini-strokes. Olives do look pretty floating in your martini glass. But, the health benefits of olives and its components are bountiful! Click here on olives to read more about it and why you may want to pay a visit to your next olive bar soon. A usage date is at least several months from when you are purchasing it. Further, do not buy oil that is older than a year or so. 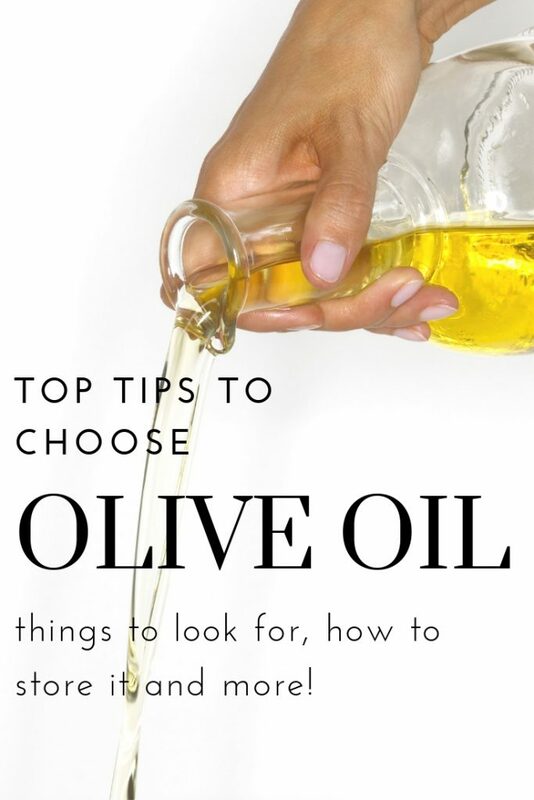 The olive oil is stored in a dark, glass bottle or tin. Exposure to light and heat can destroy the flavor, At home, store your oil in a dark cabinet away from the stove. It is extra virgin. Extra-virgin oils undergo minimal processing leaving great flavor and aroma as well as its abundant health properties. It is organic. The U.S. Department of Agriculture seal ensures that at least 95 percent of the oil, imported or domestic, is made from olives grown without the use of pesticides or synthetic fertilizers. However, the seal is not necessary as many smaller olive oil producers adhere to the same organic practices but may not be able to afford certification. There is an estate name on the label, which may be a sign of good quality. This is included by many small producers who grow and press their own olives. Also good is a seal indicating the oil-producing region where the oil originated. The amount you are purchasing is an amount you will use within a month or two. It is best to buy smaller quantities as it can go rancid. Try infused olive oil to enhance your dishes. This post lists some ways to infuse your favorite olive oil. Olive oil is an additive in many skin creams. However, tyrosol in olive oil is only effective if taken in large amounts. Be sure that olive oil is one of the main ingredients of the lotion or cream. Or even better, use olive oil straight to moisturize your body, just like Jeanne did! Check out this post on oil smoke points and on why olive oil is NOT a good oil to cook with or heat. It is ideal for salad dressings, over pasta or hummus or as a flavored dip, though. Olive leaves are made into tea and capsules, however, to reap the benefits of olives, the fruit and the oil are a better choice as tyrosol is most abundant in those forms. This is so simple but a favorite in my house. It is so tasty and good for you with all the olive oil and fresh garlic and herbs. The garlic paste makes a big difference here as it dissolved in the oil nicely rather than small bits of garlic. Fresh or dried herbs are fine with this. If using dried, just use a little less. Serve with: Bread of choice or nice with thin stalks of fresh asparagus or green beans steamed. Taste and adjust seasonings. Add more salt if needed after tasting. Serve in a glass container as colors of herbs with the oil are lovely. Do you have a favorite brand of olive oil or a best dish with olives? Please share in the comments!